Board games have been played in Africa for thousands of years and you can find information about ten of them in the list below. One of the oldest known board games in the world is Senet from Egypt. Unfortunately, no one wrote down the rules, so historians have had to make them up. Many of Africa's traditional board games can be played using materials found in nature. Seeds and stones make perfect game pieces, and boards can be scratched into the dirt, dug out of the ground, or drawn on a piece of paper. 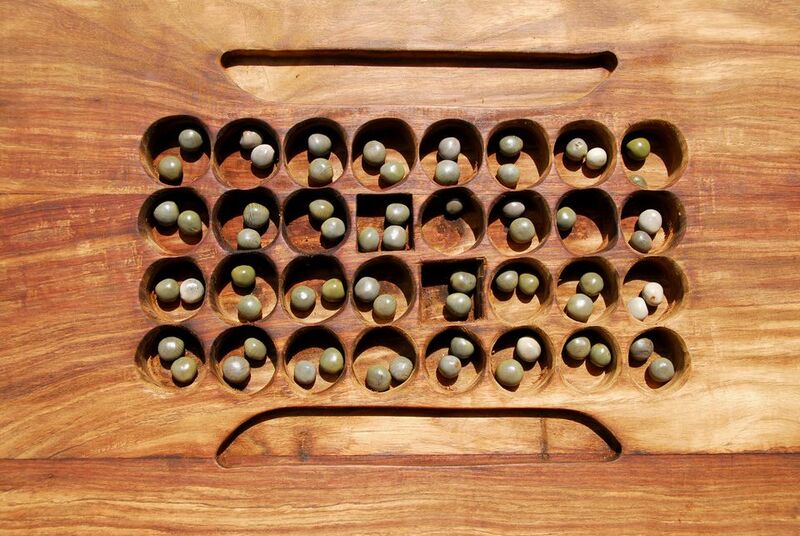 ​Mancala is an African board game that is played worldwide, there are in fact hundreds of versions played in Africa. Mancala is one of oldest games in the world, dating back thousands of years. Pits have been found carved into the roofs of ancient Egyptian tombs in Luxor and Thebes. You may know the game as bao, mancala, oware, ayo, omweso, enkeshui or aweet. There are in fact more than 200 versions of this "count and capture" game, played throughout Africa, all with slightly different rules In North and West Africa it's common to use two rows of pits, in Ethiopia they play with 3 rows, and in East and southern Africa, they play with four rows. Some games have "stores" at the end of each board, others do not. These days you can play online, make your own board, or buy mancala on Amazon. Morabaraba is a traditional African game played by many in South Africa. A version called Shax is also popular in Somalia and Achi in Ghana. All of them are similar to 3, 6, 9 or 12 Mens Morris, played in Europe, but the true origin of the game is still in question. Morabaraba in southern Africa was used to teach herd boys appreciation for tactical thinking. The game pieces are called "cows" and the object is to form "mills" or rows of three in order to "shoot" one of the opponents "cows." Rules differ from region to region, but here are a standard set of rules. Zamma is a traditional game played in North Africa. It is a bit similar to Alquerque the grandfather of checkers. The board is square with 9 rows across and 9 down. Each player gets 40 pieces, black (called men) and white (called women). Black starts to play first. The pieces follow the pattern of the board, can only move forward, and capture their opponents by hopping over them. If a piece reaches the opposite end of the board it is promoted, like a King in draughts (checkers) and can then move in all directions. Zamma boards have been found dating back to 1400 BC, but modern ​rules appear to have been influenced by checkers and vary slightly from region to region. Fanorona is very popular board game in Madagascar and has been played for hundreds of years. Legend has it that in the 1500's a king's son was so busy playing the game, he lost his chance to inherit land from his father. Fanorona is similar to Zamma (see above), they both share a common ancestry with Alquerque. A Fanorona board is a 9x5 grid pattern where some pieces can move diagonally as well as forward and backward. Each player has 22 pieces and the object of the game is to capture all your opponent's pieces. See these rules for the correct set-up and how to play. Variations exist, usually with smaller boards but similar rules of play. Seega is a traditional board game played in parts of North and West Africa. It's thought to have originated in Egypt in the 1800s but could be much older. This two-player game is played on a 5x5 board, usually with stones or marbles. Each player has 12 pieces which are placed on the board two at a time, in turn. Once strategically placed, the capturing begins by "sandwiching" an opponents' piece. A central square on the board is a safety zone. Rules differ, as do board sizes from region to region. Seega is easy to make yourself using pennies and paper. Butterfly is a game of skill that is played in Mozambique. It is similar to checkers (draughts), but the board is shaped differently. The game board is basically, two triangles joined together at a point, in the shape of a butterfly. Each player has nine pieces which they place on each side of the board. They capture their opponents by hopping over them, using the 19 intersection points and hopping into available empty spaces. A very similar game called Felli in Morocco is played on a smaller 6x6 board. And Lau kata kati is also closely related and played in South Asia. Games from Everywhere has a lovely board for sale, or you can simply draw the board on a piece of paper and use buttons or coins as pieces. Tsoro Yematatu is a simple two player strategy game that is thought to have originated in Zimbabwe. The board is a basic triangle with two equal sides. Each player gets three game pieces each. There are 7 points where pieces can be placed, three along each side and one in the middle. The aim is to create a row of three with your color pieces. You can jump over your opponent into an empty space. This game can last a while and end in a draw, so some rules state you cannot jump over your opponent. Kharbaga is very similar to Zamma. The boards are smaller (usually 5x5 or 4x4 grids with squares) but pieces are allowed to move in more directions. Each player has 20 pieces. Players alternate their turns, can move one piece at a time and capture their opponents by hopping over them. Similar to checkers (draughts) the pieces can only move in a forward direction until they are crowned "king" or "mullah" by reaching the opposite end of the board. Dara is a game that's been played in Nigeria for several hundred years. It's a bit similar to tic-tac-toe (noughts and crosses). The game is traditionally played by the Dakarkari people. The board is made up of squares in a 5x6 grid (sometimes a 6x7 grid). Each player has 12 stones which they drop alternately into the empty squares. When a player has three in a row, they can take out an enemy piece (in this way similar to Morabaraba). A player wins when his/her opponent cannot form three in a row. Senet is one of the world's oldest board games. A lovely painting in the tomb of Egyptian Queen Nefertari depicts her playing Senet in 1295 BC. The Senet game board is a grid of thirty squares, arranged in three rows of ten. Apparently, the original rules were passed along verbally, because no written form has been found. Each player has a set of 5 pawns, and what to do with them has been left up to educated guesses by two historians. The rules they devised created a game that is similar to backgammon. Four sticks, black on one side and white on the other, are used like dice to move the pawns 1,2,3,4 and/or 6 paces. You can buy Senet on Amazon or download it to your iPhone.